LOCATION: “Sunnyside,” the original log cabin from Susan Allison’s homestead, restored by the Stewart family of Quails’ Gate Winery, 3303 Boucherie Road, West Kelowna. 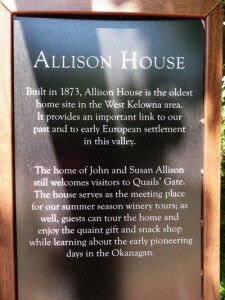 Built in 1873, Allison House is the oldest home site in the West Kelowna area, located on the Quails’ Gate property. John Allison was born in Leeds, England in 1849, the son of a surgeon. 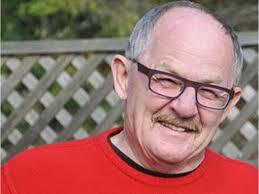 He came to the U.S. with his parents in 1837 and he participated in the California gold rush as a boy in 1949. He came to B.C. in 1858 with the gold rush. Governor Douglas urged Allison to prospect for gold in the Similkameen and Tulameen areas in 1860. In September of the same year Allison and others pre-empted land which later became the townsite of Princeton, but they failed to complete their titles. Allison staked gold, copper and coal claims and established the first cattle ranch. His first wife was Nora Yakumtikum, a First Nations woman who bore four children and also ran a pack train for the Hudson’s Bay Company. 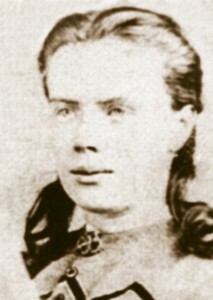 Allison later accumulated more land for farming and ranching, marrying Susan Louisa Moir in 1868. Their house at Allison Flats, east of Princeton, was the first “white” house in the Similkameen valley. 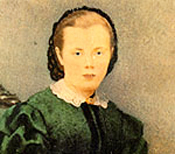 Susan Allison was born as Susan Louisa Moir in Ceylon (now Sri Lanka) in 1845 where her father owned a tea plantation. Upon her father’s premature death, she and two other children accompanied their mother to England where her mother remarried to a Scotsman, who somewhat foolishly brought them to Fort Hope on the Fraser River when Susan was 14. 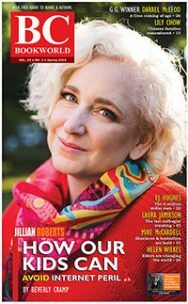 It’s not known if Susan Moir knew John Allison already had a First Nations wife and three children when she married him; but given her straightened circumstances, perhaps that was less important to her than escaping from poverty. From 1873 to 1881 they lived on the west bank of Okanagan Lake, where she gave birth to the first “white” children born in the area, until their ranch lost 1000 head of cattle in the winter of 1880-81. During this period their settlement was named Sunnyside, a name that disappeared after their departure. It resurfaced in a 1931 newspaper in The Province newspaper about Okanagan pioneers. 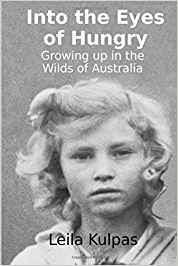 Gradually the name resurfaced after the publication of Margaret Ormsby’s book about Susan Allison. 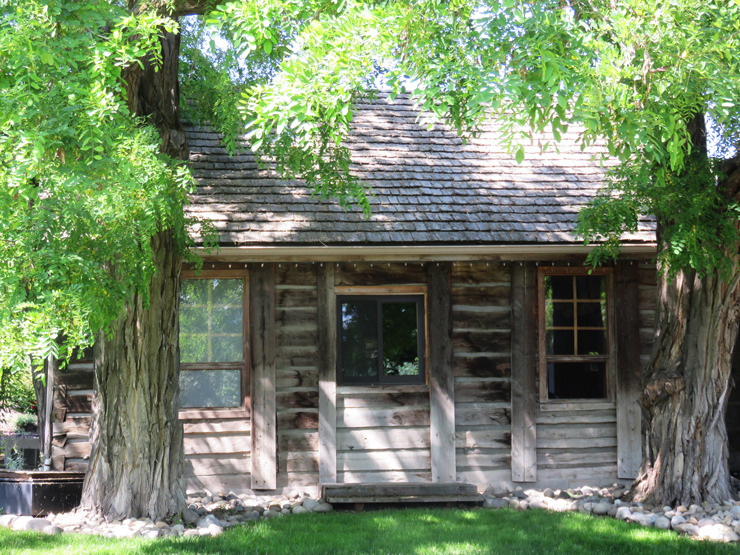 “Sunnyside,” the original log cabin from Susan Allison’s homestead, 3303 Boucherie Road, West Kelowna. Built in 1873. The community to which the Allisons went after Sunnyside was originally called Vermilion Forks, named for the red, yellow and orange ochre that Indians used for face painting, but it was also widely known as Allison’s or Allison Flats. The name change to Princeton was made in 1860 in honour Prince Edward, the Prince of Wales, but he never visited the town. THE LAKE / N-HA-A-ITK, an opera by Barbara Pentland and Dorothy Livesay about Susan Allison, had its world premiere in 2014, starring Heather-Pawsey and Delphine Derickson. Darren Hull photo. Susan Allison moved to the coast in 1928. She died in Vancouver in 1937 at age 92. Susan Allison’s recollections were published under the title of A Pioneer Gentlewoman in British Columbia: The Recollections of Susan Allison (UBC Press, 1976), edited by Margaret Ormsby. 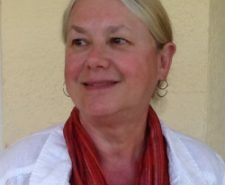 Later, Diane Sterne published a collection of selected works by Susan Louisa Allison (née Moir), dubbed Mother of the Similkameen, called In Her Words. Sterne’s book was prepared in celebration of Princeton, B.C.’s 150th birthday. Her poetry and stories (some of which were written under the pen name of Stratton Moir) recount Indian legends told to her in the 1800’s when she ventured into the British Columbia interior with her new husband, John Fall Allison. With the assistance of members of her family and the Princeton Museum, this collection of lost writings has been preserved. Included are: “In-Cow-Mas-Ket” and “Quin-Is-Coe”. Sixty years after its radio debut, a “true-life Canadian opera’ inspired by Susan Allison’s life, THE LAKE / N-HA-A-ITK, by Barbara Pentland and Dorothy Livesay, was accorded its world premiere on stage in 2014 by Astrolabe Musik Theatre and Turning Point Ensemble in collaboration with Westbank First Nation. Soprano Heather Pawsey sang the role of Susan Allison for three performances on the site of the Allisons’ original 1873 Sunnyside ranch, West Kelowna’s Quails’ Gate Winery. A Pioneer Gentlewoman in British Columbia: The Recollections of Susan Allison (UBC Press, 1976).